Dean Winstanley exited the PDC World Darts Championship at the first round stage after a thriller of a match with Ronny Huybrechts. A tie break was required in the decisive fifth set with Huybrechts just edging clear to take the 3-2 win and set up a second round match with world number four Peter Wright. Rotherham-born Winstanley will take some comfort from his performance on the Alexandra Palace stage after enduring a year of poor form. Without anything better than a top 16 tournament finish since March, the Swinton thrower nevertheless provided a tough test for a top professional in Huybrechts. It had been Winstanley’s aim to start the match strongly and he certainly delivered. But he failed to keep the intense pace throughout. 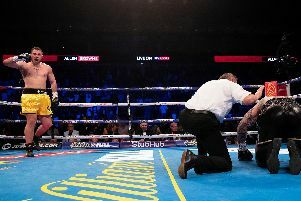 He landed a maximum in the first leg, broke throw off 96 in the second and took the set in quick time without a response from his Belgian foe. Huybrechts responded well however and quickly levelled the match. World number 29 Winstanley would be left ruing his finishing at the end of the third set as he missed eight darts at a double in the deciding leg to see Huybrechts open up a 2-1 lead. His disappointment would not last long as he levelled up at 2-2 to force a deciding set. But again he missed a golden chance. Moving 2-1 up in the set, he needed just on more leg to advance. Huybrechts levelled up, meaning the winner would need an advantage of two clear legs. The two men were neck and neck to 4-4 as the tension rose. But Huybrechts edged ahead before securing a tenth leg to take the set at 6-4 and the match.